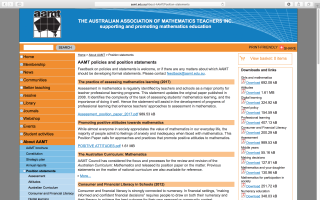 AAMT's new professional learning site: download powerpoint slides and handouts; use online tools to track your learning; network with other educators. What's in your top drawer? 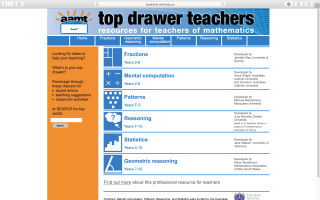 Big ideas, common misunderstandings, examples of good teaching, assessment ideas, and student materials on a variety of topics: fractions, geometric reasoning, mental computation, patterns, reasoning, and statistics. 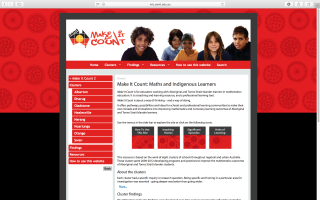 A site to support schools with pathways, strategies, tools and resources to improve the mathematics and numeracy outcomes of Aboriginal and Torres Strait Islander learners. Based on the work of the eight Make it Count clusters during 2009–13, the resource is organised around Professional Knowledge, Professional Practice and Professional Engagement. 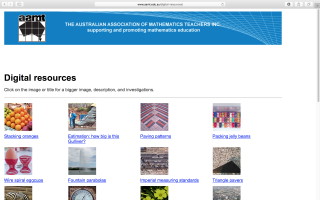 A collection of photos with accompanying mathematical activities and investigations. 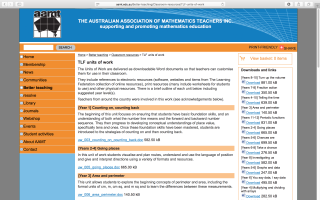 A collection of units of work for a wide variety of year levels that were developed by teachers from around Australia. Units can be downloaded as Word documents and topics include time, arrays, fractions, area and perimeter, and more. Units include references to electronic resources, print resources (many include worksheets for students to use) and other physical resources. 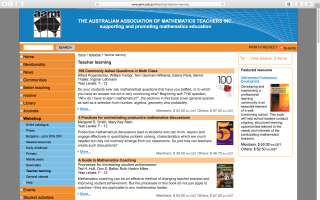 A national program run in conjunction with the Australian Academy of Science that provides resources (Foundation to Year 10) to help students learn mathematics in innovative and engaging ways. 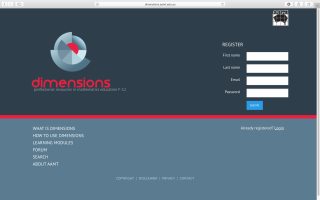 A subscription website hosting a collection of interesting and successful mathematics lessons. Maths300 lessons are highly accessible to a broad range of students, featuring low floor, high ceiling tasks. Lessons embrace qualities such as non-threatening learning environments, open-ended inquiry, broadening pedagogical and assessment repertoires, success for all, the role of context and the inclusion of technology. 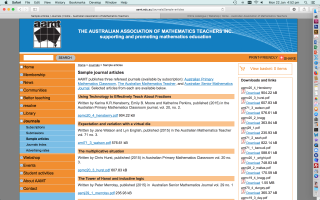 AAMT has a growing collection of free articles from its three journals – Australian Primary Mathematics Classroom, The Australian Mathematics Teacher, Australian Senior Mathematics Journal – available for download. 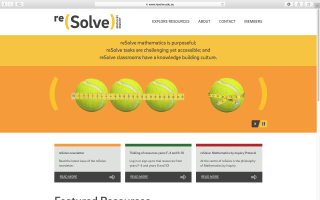 Books, manipulatives, software and more. Shopping for a resource? Try AAMT's webshop! What does 'doing mathematics' entail? 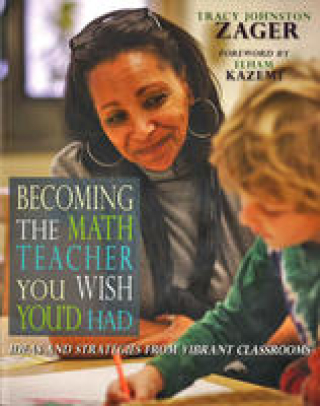 Each chapter in this book is organised around the real work of doing mathematics in classrooms by students and teachers as practised by mathematicians – demonstrating that mathematics is about reasoning and proof, but also about making connections, rising to challenges, taking risks, and making mistakes. It is full of stories, ideas and strategies to try. Read it in its entirety or dip into individual sections. A great basis for staff professional learning! Connect with AAMT on social networks for more links to online news, tools and tips!